The winners: Acropora corals. Credit: Albert Kok at Wikimedia Commons. Except it’s not that simple, the authors of a new study warn. Since 14 years is hardly the long long run. The losers: Pocillopora corals. Credit: Mila Zinkova at Wikimedia Commons. In a new paper in the current issue of MEPS we get a sense of what happens in the short long term aftermath of a big coral bleaching event. Background: Coral bleaching occurs when water temperatures rise, stressing the coral animals enough to expel their symbiotic partners—the zooxanthellae. These single-celled plants give corals their beautiful colors and help feed them through photosynthesis. 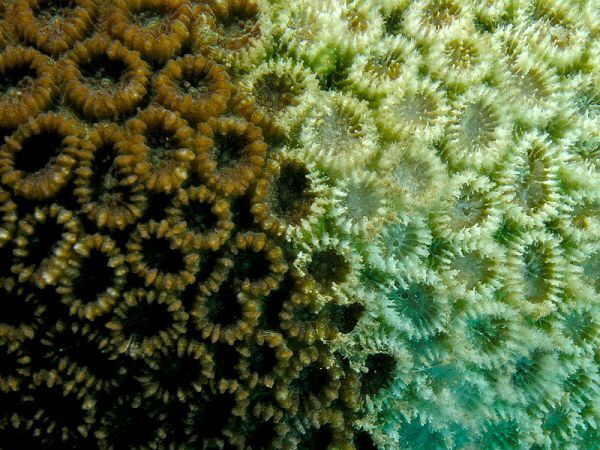 In some plant-animal partnerships, the zooxanthellae entirely feed their corals, making those species more vulnerable to bleaching. In the past 30 years, rising sea surface temperatures have stressed and bleached corals worldwide. Yet few researchers have looked at what recovery looks like over time—whether the species of corals that fare better in the short term also fare better in the long term. A partially bleached faviid coral. Credit: Nhobgood at Wikimedia Commons. Short-term winners were generally heat-tolerant encrusting and massive corals, like Porites, faviids, and small (<5 cm/2 in) Acropora colonies. Credit: R. van Woesik, et al. MEPS. DOI:10.3354/meps09203. The last point is interesting because it means that having healthy reef neighbors enabled some species to recover—thanks to seeding from nearby islands. The present study suggests that as the oceans warm even further, the coral assemblages will change. 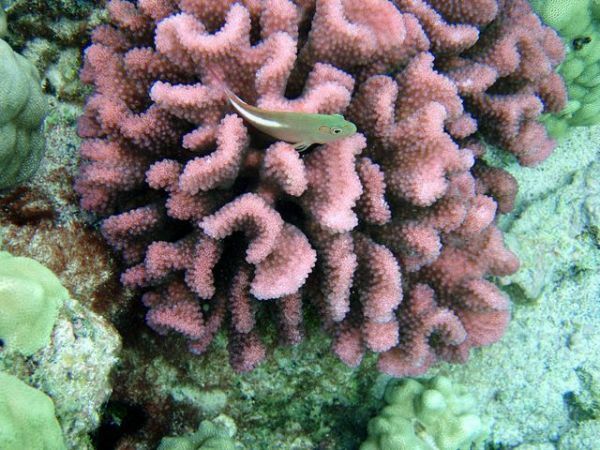 Reefs may soon essentially only support heat-tolerant coral species. The narrowing of genetic diversity within communities is likely to impact other dependent species such as fishes and crustaceans, especially if important reef-building branched corals, such as Acropora, Stylophora, Pocillopora, and Porites cylindrica, become rare on account of their inherent sensitivity to thermal stress. Bleaching may also become punctuated over the next several decades. 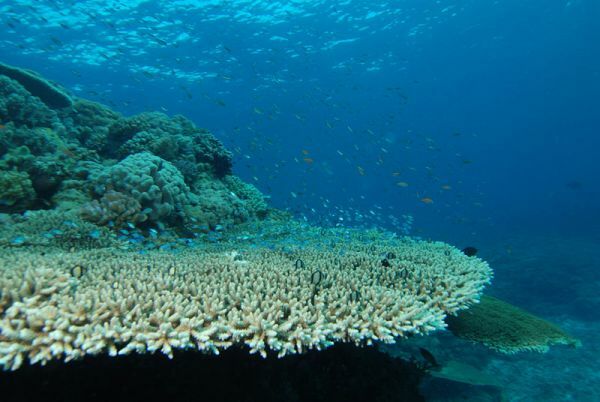 In the short term, the remnant yet hardy populations may show some resistance to the higher water temperatures, and bleaching may be reduced for a decade or more if Acropora and pocilloporids are removed from local reefs. However, reduced bleaching may give false hope because once the inevitable temperature threshold of the remnant communities is surpassed, widespread coral mortality will follow. Given that even the hardiest coral genera have their limits, global temperature increases will eventually lead to an exponential rate of local, regional and global reduction of coral species. 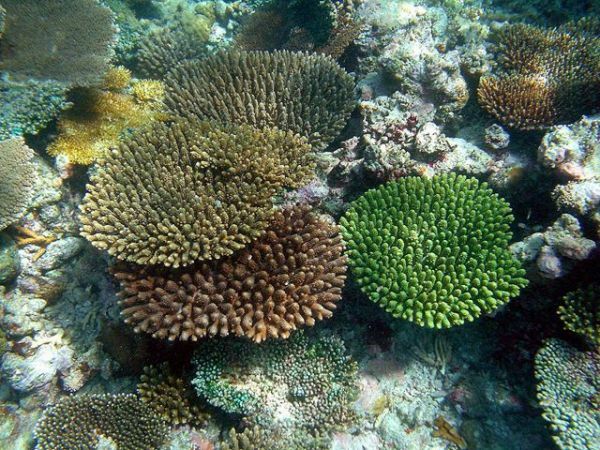 To what extent this reduction of coral species will occur will depend on how rapidly and by how much the ocean temperatures increase, which depends on the fossil-fuel-emission pathway that humans choose. Coral recovery underway on a reef. Credit: Bruno de Giusti at Wikimedia Commons. 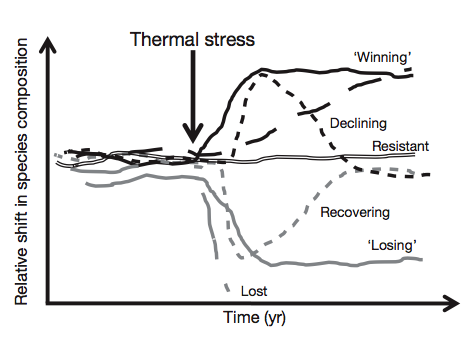 van Woesik R, Sakai K, Ganase A, Loya Y (2011) Revisiting the winners and the losers a decade after coral bleaching. Mar Ecol Prog Ser 434:67-76. DOI:10.3354/meps09203.